What is BRiDGES Tobacco Prevention Program? BRiDGES to Prevent Tobacco is a public health policy advocacy program aimed at preventing the many deadly diseases caused by tobacco in Herkimer, Oneida, and Madison Counties in Upstate New York. We are not an “anti-smoker” group. We realize the tobacco industry has caused deadly addiction by lying about their products and ingredients. We advocate for truth in advertising, labeling, and product design, as well as holding the tobacco industry accountable for its actions. BRiDGES-Madison County Council on Alcoholism and Substance Abuse is a nonprofit organization dedicated to preventing addictions to alcohol, drugs, tobacco, and gambling. BRiDGES Tobacco Prevention Program is a program of BRiDGES-Madison County Council on Alcoholism and Substance Abuse. The program is funded and overseen by the New York State Department of Health. The state receives hundreds of millions of dollars from lawsuits against tobacco companies, cigarette taxes, and additional funds from the federal government. A portion of these monies are used to prevent children from becoming smokers. When did this project begin? BRiDGES-Madison County Council on Alcoholism and Substance Abuse has served the community for more than 20 years, and has been working to help smokers quit and prevent kids from becoming smokers for many years. On August 1, 2009, BRiDGES Tobacco Prevention Program was launched as a result of merging two existing programs (formerly known as Tobacco Free Madison County and Smoke Free Mohawk Valley). Where is BRiDGES Tobacco Prevention Program? BRiDGES main office is in Oneida, New York. The program is community-based, so activities will take place in person throughout Herkimer, Oneida, and Madison Counties. 1.Join our E-Advocates network (click here). We provide colorful email newsletters once a month or so. Your email address will be kept confidential, and you can unsubscribe at any time. This e-newsletter is the way you can keep abreast of our projects and ways to participate. 2. Contact us to volunteer. We are always looking for community members who are willing to talk to elected officials, landlords, and business owners about tobacco policies, and write letters to newspaper editors. 3. We maintain a website called Share Your Story where the community can share their experiences with tobacco. BRiDGES Tobacco Prevention Program uses the stories to let decision makers know how the community is affected by tobacco and to prevent others from starting. Why worry about prevention? Why don’t you just help smokers quit? Other programs exist to help smokers quit, such as the NYS Smokers’ Quitline and Tri-County Quits. Prevention is the most effective and economical strategy available to reduce tobacco-related diseases and deaths in the United States. Prevention programs save money and save lives. 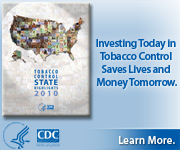 Tobacco use is the leading cause of preventable death in the United States. It causes billions of dollars of avoidable costs to taxpayers and insurers—only a fraction of which is reimbursed by excise and sales taxes. The majority of daily smokers (82%) began smoking before 18 years of age, and more than 3,000 young persons begin smoking each day. Help us prevent them from becoming the next generation of smokers.